Welcome to our online abode. 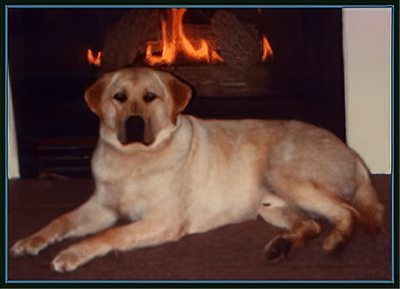 We are Linda Wyatt-deGroot and Harold deGroot, Staghorn Reg`d Labradors. In the 20+ years since Staghorn was registered, we have produced several top winning Champions, including Best in Specialty Show winning adults and puppies as well as several obedience and working certificate titled dogs. Many of our dogs have gone on to become definite assets in other breeding programs, both accross Canada and the USA. We maintain a small breeding program of select Labrador Retrievers in S.E. Ontario, Canada. We are located 2 hours from Toronto and 2- 1/2 hours from Ottawa. Please visit our males and females to see the current Labradors selected for our breeding program. All of our breeding dogs have appropriate hip and elbow certifications and annual CERF eye clearances. Their PRA status is known, either via Optigen testing or parentage. They are from strong pedigrees of Canadian Kennel Club or American Kennel Club titles and ALL have the friendly temperament and overall good health that families time and again, are looking for. Our puppies are home raised and sold on a CKC non breeding registration. They are registered, tattooed, vet examined and vaccinated, de-wormed 3 or more times, and come with a 2 year written health guarantee, a comprehensive information package including a health report/summary. I provide ongoing support and guidance for the LIFE of your puppy. If for any reason you cannot keep your puppy, he/she will return to Staghorn and a new home will be carefully screened. I have been involved with Labs all my life. My father was an avid duck and wild game hunter and raised and trained field Labs. I got my own first Lab in 1978. Chester helped me raise my children. His urn sits stately on our "mantle." Later, our foundation stud dog Mac, (Ch. Lindenhall's McIlwain Protégé) was named after my late father, Gord McIlwain. We are very proud to have been owned by Mac. He ranked two years in a row as the Number Two Lab in Canada. ('96 & '97) Mac was the foundation of our breeding program and a very proud ambassador of our breed, who threw his kind and even temperament to his puppies. In his later years, he was a fun loving veteran who was loved by all who visited him. He has left us a legacy of love in his kids and grandkids here. Thanks for visiting our webpage. We welcome you here and invite you to check back often as we try to keep up with our current happenings. And the friendly Labs at Staghorn would love to have you visit them in person. Copyright © 2019 Staghorn Reg'd Labradors. All rights reserved.